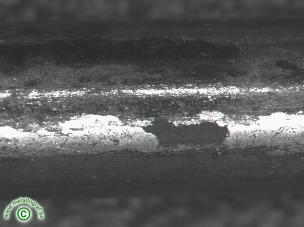 Before annealing the rod wire in a furnace with inert gas atmosphere the material becomes pickled mostly, to remove the scale arisen when rolling. An insufficient pickling leaves rest of scale on the surface. If the wire is then drawn, these rests of scale can be pressed in in the material. On the surface of the drawn wire shinier places, in the areas with the scale rests, can be stated.